Several plans for the federal government to provide paid family leave have been proposed. The Economic Security for New Parents Act, based on a plan proposed by the Independent Women’s Forum, would provide 12 weeks of paid leave. The exact amount of compensation would be calculated through the current disability benefits formula (estimated to be an average of $3,528 for a 12-week period). If an individual chooses to take this benefit, that individual would pay back the costs by deferring old-age benefit payments by six weeks to, theoretically, keep the program deficit neutral in the long term. 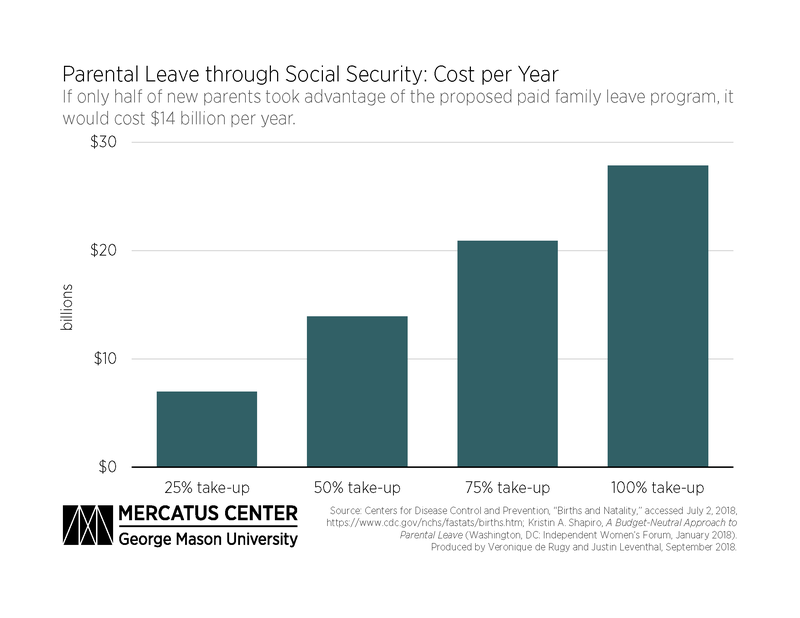 Social Security would cover the costs of paid family leave through transfers of general funds, so as to avoid speeding up bankruptcy of the Social Security trust fund in the short term. Using the number of births in 2016 as a baseline, one can estimate the future cost of parental leave payments each year, depending on the percentage of new parents who take advantage of their new entitlement. If only half of all new parents collected family leave payments from this system, the cost would be $14 billion per year. Given that it would be at least 30 years until most of this spending begins to be repaid through delayed retirement, the United States would have spent nearly $418 billion plus interest (with a 40-year repayment period this number rises to more than $557 billion). It should be noted that while the program would begin recovering its previous payments at this point, it would also be making new paid family leave commitments to parents having children in the same year. As a result this program ultimately amounts to adding half a trillion dollars to the national debt, and this amount would not change much over time unless the rate of participation in the program were to change. However, even this figure is likely too low, given that it doesn’t account for new administrative costs in implementing the system, any future increases in payments, or increases in participation rates. Additionally, this program presumes that all people who collected parental benefits will pay them back. It is an unfortunate reality that not all participants would live long enough to defer their Social Security payments, meaning their cost would not be recovered. This program also presumes that people will still be willing to pay for their parental benefits 30 to 40 years after receiving them instead of electing politicians who will relieve them of this burden once it comes due.